Remember the 4K 5.5-inch display on the 2017 Sony Xperia XZ Premium? The 2160 x 3840 resolution on the LCD panel is a conversation point when you're hanging around with your fellow smartphone fanatics. Impress them by bringing up the whopping 801 ppi on the screen. 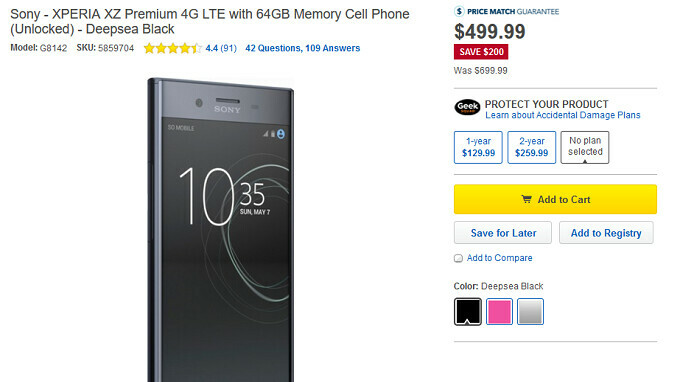 Even better, the phone is on sale at big box retailer Best Buy. Right now, you can pick up the device for $499.99, a 29% savings from the $699.99 price that the Xperia XZ Premium usually sells for at Best Buy. The colors available are Deepsea Black, Bronze Pink and Luminous Chrome. You have to love the imagination of those who come up with the name of colors at smartphone manufacturers. The phone is unlocked, but will work on GSM carriers only. That means T-Mobile and AT&T subscribers can consider taking advantage of this deal. The Xperia XZ Premium does not have a fingerprint scanner in the states, but it does feature the Snapdragon 835 mobile platform under the hood. 4GB of RAM is inside along with 64GB of expandable internal storage. The rear camera weighs in at 19MP (still no OIS, though) and there is a 13MP front-facing selfie snapper. Keeping the lights on is a 3230mAh battery, and Android 8.0 is pre-installed. The device does carry an IP certification rating of IP 68. We don't know how long the deal will be available. If interested, you can click on the sourcelink or visit your local Best Buy location. Indeed . Sure , some flaws are intact on the XZ Premium as it . But it's one great-solid phone till now .